The Dark Souls series is known as one of the hardest game series to exist (whether that is actually true is up for debate…). It has a huge following, and some people played the games so much, that they come up with so-called “challenge runs”: playing through the game in a suboptimal manner, like never levelling up, or having to satisfy certain conditions. One of those challenges is the “hitless run”: to finish the game without getting hit even once. I’ve seen some people stream on Twitch playing Dark Souls 3 with hitless runs, even restricting themselves further by specifying they’d only use the pyromancy attacks, for instance. It’s really fun to see the thought that goes into such runs, as if it’s some kind of puzzle that you need to optimise. So I thought I might as well try it myself, with a Dark Souls 2 hitless run. DS2 is my favourite in the series — many people will tell you it’s the worst, but something in this game meshes really well with my playstyle. DS2 rewards careful exploration and taking your time to explore every nook and cranny. Just barging in won’t get you far, but positioning yourself in an optimal manner, using ranged attacks and paying attention to what is happening around you, certainly helps. And a hitless run is a special kind of “cheesy” run. (When you stand at a safe spot and get rid of the enemies with a ranged attack, that’s called “cheesing”.) My love for “cheese at a distance” is well-documented, and so I see a hitless run as a special kind of cheesy tactics. Of course it’s been done before. So I have started to analyse this video to see what other (successful) people do on their hitless DS2 runs. It’s been a lot of fun to watch and analyse, and it works too! So far, I have managed to get further and get there faster than if I had played the game “straight”. Once I’ve had some base practice, I think I’ll stream some attempts, just for the laughs. I was reading through a set of articles about things that used to be A Thing and are not anymore — stuff like the walkman, VCRs and i-mode. Another one is the pinball machine. Of course, being the age I am, I played my fair share of pinball. 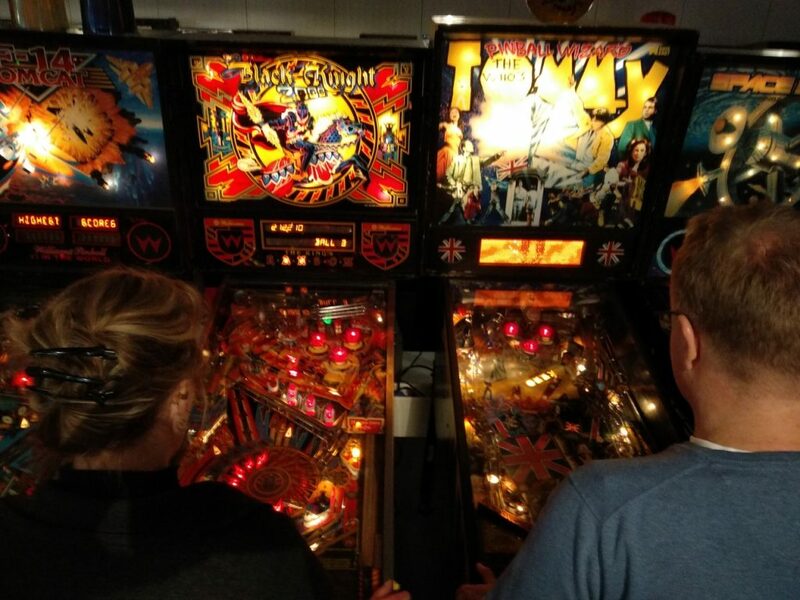 In my teenage years, we preferred the arcade video games, but during my time as a student, there were some bars that we frequented that had pinball machines. In the early 90’s, pinball machines were feeling the crunch from video games. In response, pinball machines were adding more and more digital effects, often using a LED matrix display. Wouldn’t it be fun to play pinball again? 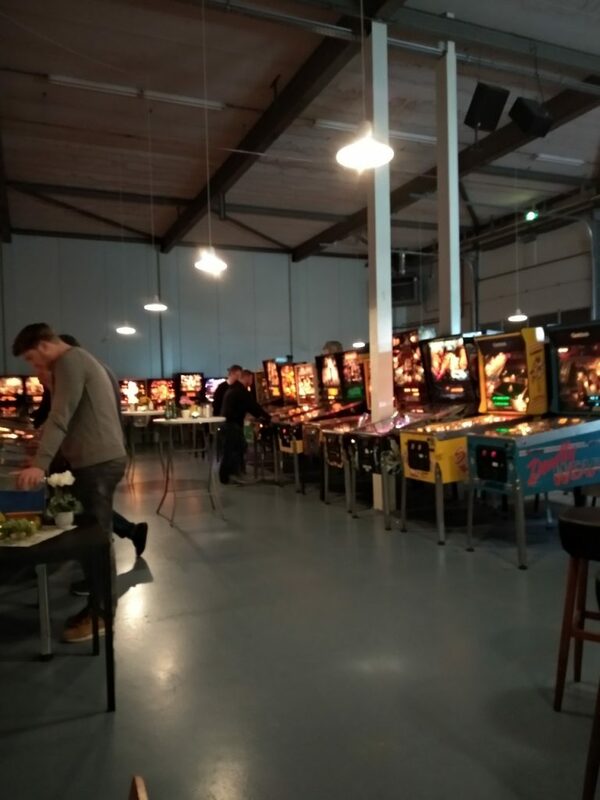 It turns out that there is a Dutch Pinball Association. 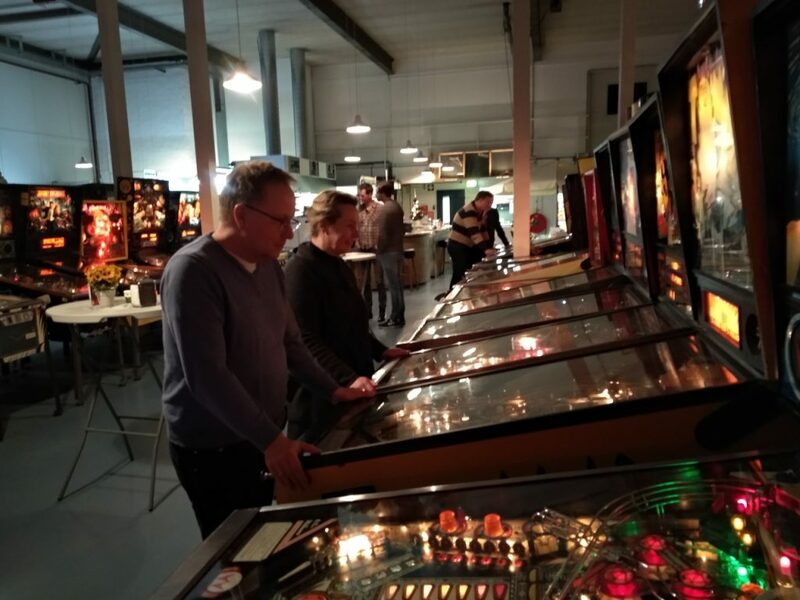 Their clubhouse, which houses 120 pinball machines, is in Veenendaal, which is only half an hour by car away… And they had a ‘Funhouse Friday’ coming up, just an open house from 15:00 until 23:00, with all the machines on free play. Entrance fee was EUR 10 for non-members, and I sent them an e-mail to ask if one could just go there as a non-member, pay the fee and play. It was possible, but you’d have to get invited by a member first. And the person in charge of the clubhouse decided that he’d invite me! Such hospitality, I really liked that. But it turned out that there were more people interested in an evening of pinball: Klik wanted to come, as well as a friend of ours. And I didn’t feel like it was proper to take advantage of the hospitality by showing up with three people instead of one. So we got a membership. And they have a semi-professional kitchen as well, so you could even have dinner there! Which is what we did. The view from the bar area. There were three ‘corridors’ like this, and there was also a line of pinball machines along the far wall. There was a good spread of machines: some really early ones, and more “modern” ones, including some that I played a lot in the early 90’s. Left: Klik playing Black Knight 2000. Right: Friend O. playing Tommy. Some months ago, there was a new Pokemon introduced in Pokemon GO: the Meltan, a metal type. It was first shown during the Chikorita community day, and turned out to be all Ditto’s. And with the launch of Pokemon Let’s Go on the Switch console, Nintendo introduced a way to transfer Pokemon to the Switch, and the reward is a box that spawns Meltan. There was a special event that coincided with the launch of the game on the Switch, that allowed you to catch a Meltan without a Switch connection. It was a nine-step special research, and it required quite some special things, like battling in 10 raids. And while the quest would stay once you started it, the event that spawned the pokemon you needed to catch ended some time ago. I had already resigned myself to not being able to finish in time, but then on the last evening my RPG session was cancelled, so I could walk around and do a few raids (in one case just throwing my raid pass in the raid and walking away). With only one hour left on the event, I finished up all of the required “research” and managed to catch Meltan! But Klik lagged behind in the number of raids, so she was still working on it. And the going was slow, because the pokemon needed were not spawning regularly! But this Saturday, as we were returning from dumping some old bookcases, I saw a Cubone on the radar — so we turned the car around and drove to the spot indicated. Sure enough, there was a Cubone and she could finish the seventh step! The eighth step involved catching two Anorith or Lileeps, and two Kabuto or Omanyte. The Anorith are spawning regularly around the gym behind the house, so that was easy. And there was one lucky Omanyte spawn that evening around here too… But that last needed pokemon was elusive! Until tonight, when someone remarked on the local Pokemon GO WhatsApp group that there was an Omanyte near the petting zoo. So we jumped in our shoes and went there without any detours. Sure enough, it was there! So now we both have our Meltans! Twitch Prime gives you free games, which is a pretty good deal. These past months they have been especially generous and I got quite a few games. One of those is Guild of Dungeoneering, in which you play the manager of an adventurer’s guild. You need to recruit adventurers (“dungeoneers”), and the types you can recruit are dependent on the facilities in your guild: you need a library to recruit a magician’s apprentice, and a stage to recruit a mime(!). You can buy extensions with the money your dungeoneers get from the various dungeons that you can send them to. The actual “dungeoneering” is the meat of the game. Your dungeoneers enter each and every dungeon at level 1 and no equipment — indeed, none of their gains carries over from dungeon to dungeon. The dungeoneer is free to choose their own path through the dungeon, and each round you have three cards to choose from a hand of five to add rooms, monsters and treasure to the dungeon. You want to entice the dungeoneer towards the path you want them to take, towards monsters that are appropriate for their level. If they defeat a monster of a level equal or higher to theirs, they gain a level — and the power level really ramps up, so you really want to guide them towards the right battles. The maps are hand-drawn on a graph paper overlay, to give that home-brew dungeon feel, which is a nice touch. The combat system is card-based: you draw a hand of cards and you choose one action card to play that round, while the monster does so too. There are cards with effects that operate on the number of cards you have to choose from: more is better, obviously. There is physical and magical damage, and you can defend against physical and magical too. Equipment can give you an additional hit point and multiple additional cards during combat, some of which are really good. Each dungeon run will give you gold, and with that gold you can expand your guild. You can add rooms that will get you a new type of dungeoneer (only one dungeoneer per type! ), rooms that will give you a blessing (you can choose one blessing when you go in) or workshops that will introduce new equipment cards to the dungeons. I have to give a shout-out to the best feature of the game: the bard. Whenever a new chapter starts, or with victory and defeat, you get a little song by a “bard” that is appropriate. There’s not much variation in them, which is a pity, because they’re a nice flourish to the game. It’s kinda fun in that each dungeon is a puzzle. But it is also repetitive and can be frustrating: some unlucky draws can cost you your victory. The randomness really makes it a bit hit-or-miss for each dungeon run. And there is no way to ‘build up’ your dungeoneers, which is a pity. The game it most closely resembles is Darkest Dungeon, but that offers much deeper gameplay. In DD, you earn treasures to build up your town, which has real effects for the adventurers you recruit. And you need to plan further ahead, since things like stress carry over from every dungeon you explore — and that is absent from Guild of Dungeoneering. So I’m not sure I’ll still be playing this months from now. The game costs EUR 20 on Steam, and I don’t think I would get my money’s worth out of it for that price. Heck, it’s twice as expensive as Darkest Dungeon, which you can get for EUR 10 in a sale right now on GOG, and that is the better game of the two. We have been going on little walks in the evening around our neighbourhood for a while now. There’s lots of greenery and parks around here, and we’re at the edge of the city, so we can just walk into the countryside if we go the other way. And then we thought that if we were going to walk anyway, we might as well have a little extra motivation and have a goal. So we installed Pokemon GO, and we have been playing quite a bit since. There are a lot of pokestops near us, and right behind our house is a Gym too! Today we were visiting family, and when we got back home, around 20:00, we immediately packed up for our tour around the pokestops. When we approached one of the Gyms that are on our route, a pair of guys with their phones out were walking the other direction. And when we went to a pokestop somewhere in the middle of a residential street where nobody has any business being unless they live there, they were there too. Turned out that they were players too, and they asked us if we were there “for the raid” as well. We had seen there was a raid going on with a super high level monster in the gym we passed, but of course we don’t have any hope of defeating that monster with just the two of us. Turns out that there is a Whatsapp group of Pokemon GO players in our part of the city, and they had coordinated to meet at that gym in about ten minutes later to battle that rare and super-strong pokemon. So we made sure to be there at the designated time, and people were happy to have us on board — even though we’re total beginners and much weaker than almost everyone there. It was a good opportunity for us to gain some XP… In the end, there were 19 trainers (out of a maximum of 20) doing battle together, and we managed to bring the beast down! Whenever that happens, you get a number of special balls (determined by a few factors) to try and catch that pokemon that had been raiding the gym. Of course, being a low level doesn’t really help when trying to catch such a powerful pokemon, and indeed I did not succeed (though I did go from level 20 to 21 in one fell swoop)! But klik had more luck, and she managed to catch this mythical-level pokemon! We were added to the group by the group admin, and then the rest went on to do a raid somewhere else, while we continued our round. The group is quite high-traffic, but if we can coordinate more things like that, it’ll be good fun! I’m still playing Fire Emblem Heroes, in a low-key way. It’s a fun diversion, and it’s fun to see your heroes grow and thereby open up new possibilities. But there is an element of chance in there: when you summon a new hero, there is a randomiser that determines who you get, and at what star rating (from 3 to 5 — 1 and 2 star heroes can be earned by completing special maps). And you can get the same hero multiple times. So you end up with a whole roster of heroes, and some are duplicates, and they can have different star ratings. You can send heroes home (remove them from your roster), and gain items that you can use to upgrade other heroes, so that’s something you want to do with duplicate heroes that you’re not going to actively use. But you also want to get balanced parties: a party with only sword fighters won’t go far. So I thought it would be cool to have a spreadsheet with all my heroes, so I can do some analysis and make informed decisions, because the game itself doesn’t really offer any analysis options. Yes, you can sort the heroes according to up to four criteria, but you can’t answer questions like “How many mounted lance fighters do I have and what are their star ratings?” easily. As always, I set to work to see what I could come up with. I started out by using Apowermirror to mirror my phone screen on a PC. Then I wrote a macro for AutoHotKey (which can do amazing things) to click on certain spots in that window (which would be sent as taps to the phone) to go through the heroes. It also made screenshots with the printscreen button, which I then saved to file with irfanview from a commandline. So I ended up with shots of all my heroes. Then, using ImageMagick to cut out the part of the image that contains the star rating, masking that and then comparing it with prepared images of all the different star ratings. That allowed me to determine the star rating of each hero! All that was missing was to determine the name of the hero, so that I could cross-reference that with one of the many wikis. I tried using Tesseract, an open source OCR engine. The idea was that I would cut out the part of the image that contained the character name, and pass that through the OCR to find the name. However, the recognition quality was just too bad, because of the fuzzy, anti-aliased images. An alternative would be to manually type in the name of the character for each hero, and maybe correlate the image of that name with all the other names, but that’s costly in terms of processing power, and is just too much manual processing to make it worth my while. So I shelved that little project. Too bad, but it was fun to see how far I could take it with a few evenings of tinkering. Yesterday, I installed Fire Emblem Heroes out of idle curiosity. I’ve never played a Fire Emblem game — I do know that they’re tactical RPGs, and I did see someone stream Awakenings. I’m not big on tactical RPGs, because I tend to do bad at them, but surely a little mobile game wouldn’t be so bad? The backstory of the game is nuts: the idea is that someone is opening portals to the worlds of all the different worlds where the Fire Emblem games are set, and all those heroes are forced to fight, in order to invade ‘our’ world/kingdom. You assemble teams of 4 heroes, and a battle is indeed a tactical fight, similar to the games — except much smaller in scope because of the reduced team size and because the map has to fit on a cellphone screen! There is a lot of artwork, which I assume is all recycled from the games: all very detailed and with lots of the usual anime aesthetic. The sprites are quite cute too! You can get more heroes by summoning them, which costs ‘orbs’. You earn orbs by completing maps, but of course you can also buy orbs — and of course I’m not doing that, they’re quite expensive! So far, I enjoy it for some low-blood pressure games. I’m not sure how long it will keep me occupied, but we’ll see. If you play the game too, send a Friend Request to ID 2742473216. Not sure what that actually does, but I’m sure it’ll be fun. A friend of mine is a journalist for a Dutch newspaper — the one my father has been subscribed to as long as I can remember, so I’m going to say it’s a quality newspaper. My friend is also a gamer, and one of the games that speak to a lot of gamers is of course, Dark Souls. Tomorrow, the remastered version of the first Dark Souls game will be released, and that warranted an article. She got me and two other friends in a video chat and interviewed us about Dark Souls. So now I’m in the newspaper! I quite like the article, and apparently it has gotten some very positive feedback too. So yesterday I was playing Ni No Kuni II, and it’s a rather standard action RPG with some really smart (and cute!) mechanics and a good story. It also looks really cute: it makes the most of the cell-shaded engine it uses, making everything look like hand-drawn animation even though it’s all CGI. Anyway, I was following along in the plot, and I met a merchant in a dungeon. And they give me a ‘Leafbook’. This turns out to be a Facebook equivalent for this magical fantasy world! Plot-events are shown as posts, complete with comments! Every once in a while, you get a notification there are new posts, and you can go read them. You can even ‘like’ the posts! I tend to resist buying games for full price these days: I still have a lot of great unplayed stuff lying around. But Ni no Kuni II makes my little weeb heart flutter: back when the first game came out for PS3, I even bought the Wizards Edition, with the hardcover spell book and the plushie. So I checked out a stream for a little bit, and it immediately became apparent that indeed that is a game I very much want to play. So I stopped watching streams so as to not s(p)oil myself! I mentioned this on a Discord server I hang out on, and a friend mentioned that they’d watch me stream both the first and the new game. So I thought: “Well, I do have the first game, all it takes is to hook up my PS3 to the capture device and off we go!” But of course the PS3 has that dreadful copy protection thing going on. So on a gamble, I got a HDMI splitter for about 8 euros from China that mentioned the copy protection thing in the description of the item. It took three weeks to get here (as such things do), and sure enough: the protection is stripped off by the splitter, so I can feed the PS3 video to my capture device! So I hooked everything up, but… I have no audio. I could hook up a bluetooth or USB headset to the PS3 with no problem, but those are only allowed as a communication device, not to stream the game audio over them. And I could, perhaps, hook something together to make use of the capture device’s audio feed, but that has a 0.8 second delay, and that will undoubtedly drive me nuts! I would need a TOSlink-to-analog converter to actually hear the game I’m playing. Those devices are available, and for about 7 euros I can order one from China, but that adds another three weeks before I could start. All of that to play a game I have already finished…? So I got really frustrated and bought Ni no Kuni II on Steam and installed it. Today I started streaming the game, and it’s so beautiful! There are some cool parallels with the first game. It’s a lot of fun so far, but there are quite a few systems to absorb in a relatively short time, so we’ll see how that works out in the longer run.